Cyclists in the City: Evening Standard makes more increasingly fanciful claims against Cycle Highways, bordering on fiction. Meanwhile, in the real world, some very big employers start coming out in full support of safe Cycle Highways in central London. Is someone funding a poorly-informed anti-cycling stance in The Standard, I wonder? Evening Standard makes more increasingly fanciful claims against Cycle Highways, bordering on fiction. Meanwhile, in the real world, some very big employers start coming out in full support of safe Cycle Highways in central London. Is someone funding a poorly-informed anti-cycling stance in The Standard, I wonder? Over the past couple of weeks, various business groups and the City of London have briefed the media against London's planned cycle super highways. The City of London put out a rather ambiguous press release stating it had "considerable reservations about the current proposals", citing "knock-on effects on noise and air-pollution" and suggesting cyclists, pedestrians and motor vehicles need to "share the space" in the City's dense street patterns. We are talking about cycle super highways that will be running along what are very wide, multi-lane roads with horrible narrow pavements. They are among the most polluted streets in London, they are not places that pedestrians, cyclists and motor vehicles should ever have to 'share' space. It is a rather bizarre press statement, to be frank, that reads like the City hasn't done its homework. It's a shame, because the City is doing some good stuff and this is not up to the City's usual standards. The press release also claims that TfL and the City authorities haven't agreed on the plans. Interestingly, TfL has briefed journalists today stating it has held over 25 meetings with the City of London about these plans. Something can't be quite right. Both the City and business groups The London Chamber of Commerce and London First have also brought up issues about longer pedestrian crossings. This is a valid point but my understanding is that the longer waiting times for crossing points will be at most nine seconds. And what they have all failed to notice is that the cycle highways will bring about some pretty sizeable improvements for pedestrians. It took Living Streets, formerly the "Pedestrian Association" (why on earth they re-branded is anyone's guess) to point out that the new cycle highways will bring about "21 new signalised pedestrian crossings, 10 crossings converted from staggered to straight ahead and a net footway gain of 5,076 sq m". I think the Living Streets position is a good, well-balanced critique that flags some possible problems but, unlike the City of London press release and those of London First and London Chamber of Commerce, points out some true wins for other road users. A whole host of slightly smaller but still sizeable employers has also come out in support of the Cycle Highways on behalf of their staff. FTSE250 media company Euromoney's CEO (2,900 staff); the chief exec of Hammer Films, the chairman of Progressive Media (1,000 staff), the CEO of Barts NHS Trust (15,000 staff). And many more big names are due to announce their support over the coming days. For some reason, the Evening Standard's transport correspondent is ignoring this growing support. In a piece today which also announces the new consultation to upgrade the killer Cycle Super Highway 2 from Aldgate to Bow, the Standard focuses solely on repeating the (not really substantiated) concerns it has already covered three times in ever less convincing tones from the City and business groups and then adds some truly bizarre (and seemingly made up) concerns that the cycle tracks will disrupt the London Marathon. No they won't. I don't understand why the Standard is ignoring the support of big employers for these cycle tracks. The Standard has been a massive supporter of cycle tracks in central London over the past couple of years. Now that they are becoming reality, there is a sudden drip drip of poorly informed, inaccurate 'anti' cycle lane reporting. It is all deeply suspicious. Back in the real world, though, the rationale for some of these employers is plain business sense. Marc Shipper of Hammer Films points out "[My team] and I have a right to get to work safely and we support the mayor’s plans for segregated infrastructure. There is an extraordinarily vibrant creative industry based in London, the UK is a world leader in both production and post production. In an industry where thousands of collaborators get around London by bike, the least TfL can do is support their need for separate and safe cycling infrastructure." For others, though, the rationale is extremely heart-felt. Richard Kramer, co-founder of Arete, a technology equity research company explains: "I’m the MD and founder of a 30+ person technology research imagescompany in London. More than half of our staff cycle to work and cycling is the primary way we get around town to see clients and partners. The efficiency and health benefits are clear to our business.In 2005, one of our co-founders was tragically killed by a lorry while cycling. As a small company, this had a profound impact on all of us. Another such incident would surely force us to consider leaving London, despite its world-class, vibrant economy." 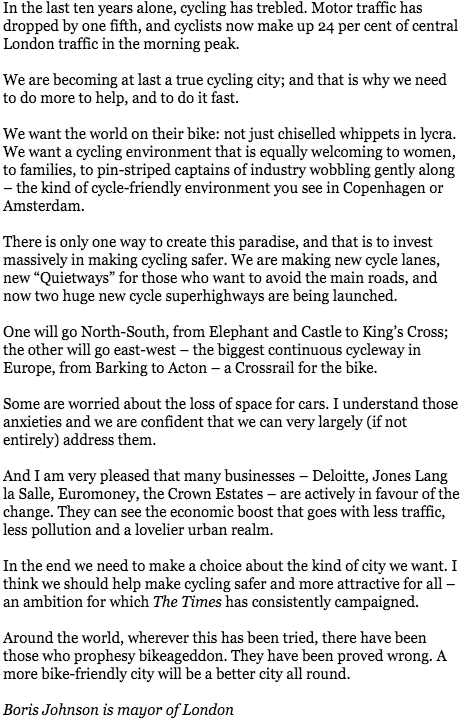 I know of several other businesses, and other large employers, both private sector and public sector, that are preparing to come out in support of the plans for real cycle super highways in London. Some of these are extremely big, well-known names. I think it's extremely impressive that employers are putting their names to the cycle super highways. It takes a lot of internal pressure to get large companies like Deloitte to make statements in support of things like this. Lots of people have to cajole the leadership and persuade them this is the right thing to do. It's a real sign that opinions about the future of London are starting to change tack. Last week, Peter Walker wrote a piece in The Guardian saying that "The opposition to London's segregated cycle lanes is living in the past". He might well be right. You can encourage your employer to get involved by using this helpful template by on the Cycling Works website. 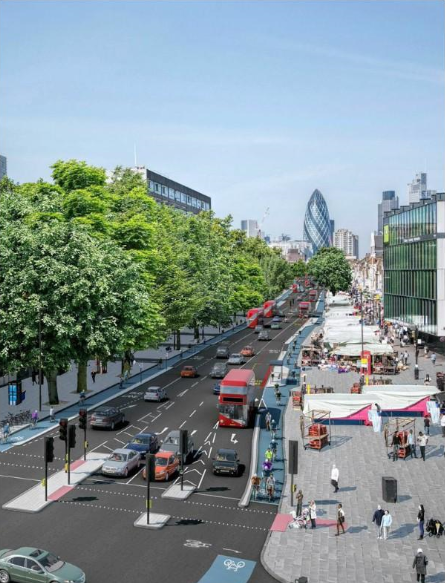 You can send your own comments to TfL in support of the Cycle Super Highways by sending a letter of support via the London Cycling Campaign website.